Model each straight wall segment independently but don’t overlap their ends just yet. Build each wall so it’s parallel with the CAD edges to which it corresponds. Don’t worry about the two wall ends that will eventually meet; keep them apart for now. Use the Push/Pull tool to extend each wall well past the point at which it should meet the other. You’re modeling something that looks like an X from above. Select the inside and outside faces of each wall. You should have a total of four faces selected. Choose Edit → Intersect Faces → With Selection. This action tells SketchUp to draw an edge wherever two faces intersect. If you had four faces selected, you should now have two new edges. Use Push/Pull to push away the wall segments you don’t need. Pushing their top faces all the way down to their bottom faces makes them disappear. Use the Eraser tool to get rid of any extra edges. 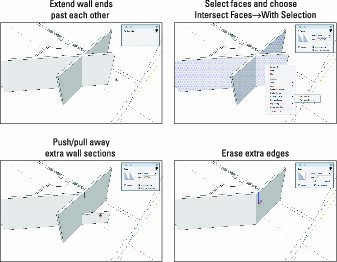 Use Intersect Faces to model walls that form non-90-degree corners.